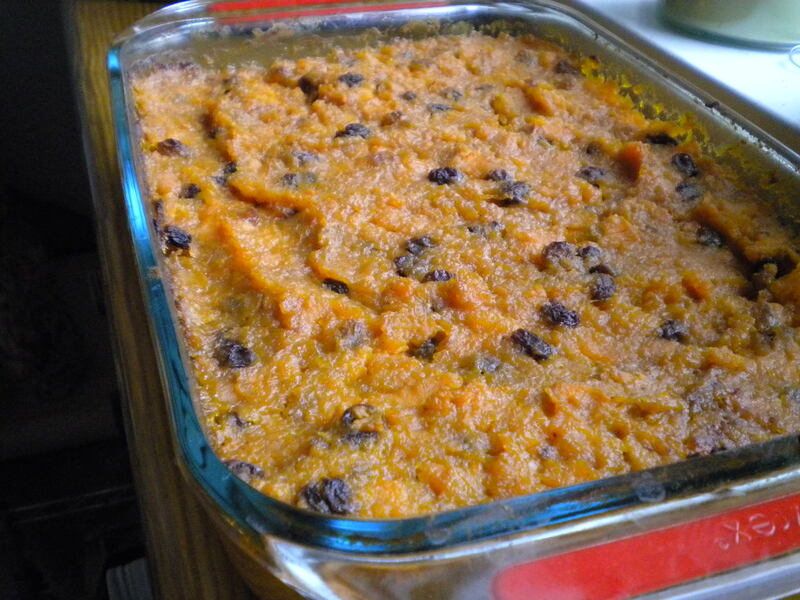 Sweet Potatoes with Maple Syrup and Brandied Raisins – Voila! Leave the marshmallows at home kids, this sweet potato dish is better without them. Now I too grew up eating sweet potatoes with marshmallows at Thanksgiving so I hold no grudge against the little white fluffy puffs. But this recipe, the brandied raisins, and maple syrup give it all the sweetness and delectability (is that a word?) it needs. Butter 9×13 glass baking dish and preheat oven to 350. 1. Combine brown raisins, golden raisins, and brandy in small bowl; toss to blend. Let soak at least 30 minutes and up to 1 hour. 2. Cook yams/sweet potatoes in large pot of boiling salted water until just barely tender, about 8 minutes. Drain and place potatoes back in pot and mash until there are only a few lumps here and there. 3. While yams/sweet potatoes are boiling, bring 3/4 cup maple syrup, 1/2 cup brown sugar, and 1/4 cup unsalted butter to boil in heavy medium saucepan over medium heat, stirring until brown sugar dissolves. Boil 2 minutes. 4. Drain raisins and add to pot of yams/sweet potatoes. Then add cinnamon and cream and mix until fully combined. Finally, add maple syrup mixture. Using a whisk mix all together. Pour into buttered pan and drizzle with a little maple syrup. 5. Bake yams/sweet potatoes uncovered until thick and bubbling, about 40-50 minutes. Let stand 10 minutes and serve. NOTE: Can be made 2 hours ahead. Let stand at room temperature. To reheat, place foil over pan, place in oven at 350 and cook for about 15 minutes or so.